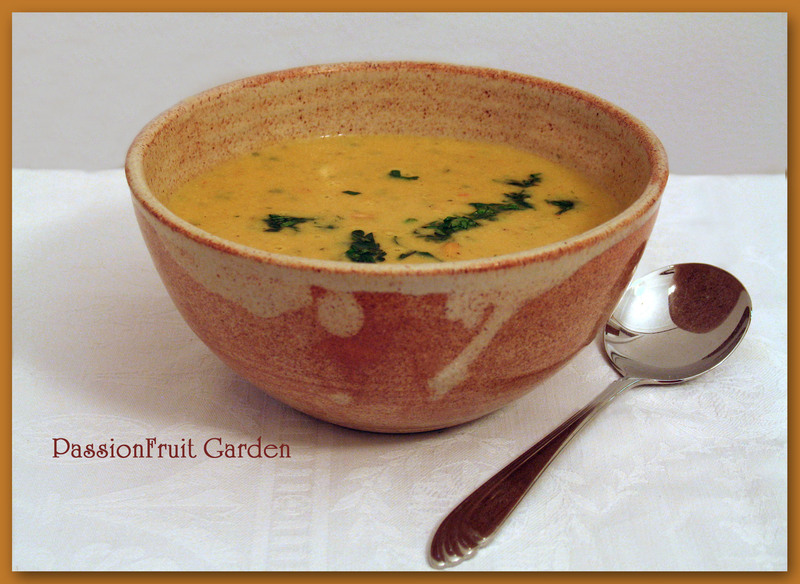 The weather has finally broken in Perth and it is cool enough to consider soup. Remember those pumpkins and the pumpkin soup recipe I promised? This is my favourite pumpkin soup recipe, ever. I found it in my November 2008 copy of Cuisine magazine. Cuisine magazine is a NZ publication. It’s a great food, wine and life style magazine. It’s the only magazine to which I subscribe. The magazine used to have a section on its last pages where people could write in and request a recipe from a restaurant they had visited. Karen Wilkins was one reader who wrote in. Her husband and she had visited Volantis, at Mt Maunganui, where she had ordered the pumpkin, cashew and coriander soup. She requested the recipe. The magazine reported that it was the best pumpkin soup they had ever tried. I agree. Here is the recipe that the owner of Volantis agreed to be published. I have not categorised this recipe under “Something Simple” only because you need to make a spice mix before you start. After that, it is as easy as any old pumpkin soup recipe. The spice mix makes way more than you need so the next time you make the soup, it will be a very simple but very impressive dish. Dry roast all the seeds. Grind and, when cold, combine with the balance of the spices. Heat the oil and fry the spice mix. Fry until the mixture separates from the oil and releases its oils – a minute or two. Add the onion and garlic and gently fry until softened – do not colour. Add half the coconut cream, the chilli sauce, carrot, pumpkin, pepper and salt and enough water to cover contents by 1 cm. Cover and simmer until the pumpkin is really tender. Add the cashew nuts and the lime juice. Whizz everything together with a stick blender. Add the rest of the coconut cream, bring back to the boil and simmer for a few minutes. Add more Thai chilli sauce, lime juice, salt or pepper to taste, if necessary. Serve with a few whole cashews, coriander leaves and sour cream (if you have remembered to buy it). This is really filling and a meal in itself. We had it for dinner and lunch and lunch and …. If serving as an entrée, serve only a small bowl and don’t forget the sour cream! 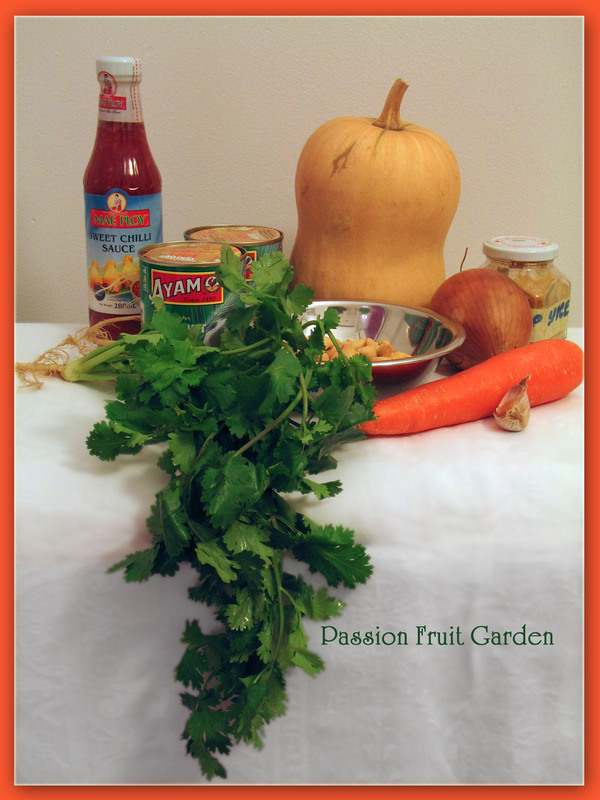 This entry was posted in Eating your bounty, Pumpkins, Soup, Vegetarian, What's for dinner? by Glenda. Bookmark the permalink. I won’t tell everyone how many spices you have promise, but when you were away and we were dog sitting I counted them, ran out of fingers and toes. Hey and that was only in Perth!!! What about Harry, Bella, Jules, Maggie and Lily? Didn’t you take advantage of their paws? Looks delicious,If I could use ready made spices will the taste be the same? Hi Sponge, Any spice mix that would work with coconut would work, as it is the mix of the coconut flavour and the spice mix flavour that predominate. Just yummy! Ideal for a lunch or dinner on a wintery day.